Chee choo chee choo chook. That's the sound of an Incredible Change-Bot transforming from its robot form into, say, a microwave oven. Of course, that's also the sound we remember from the old Transformers cartoons — the sound that was conspicuously missing in Michael Bay's movies (among other things). 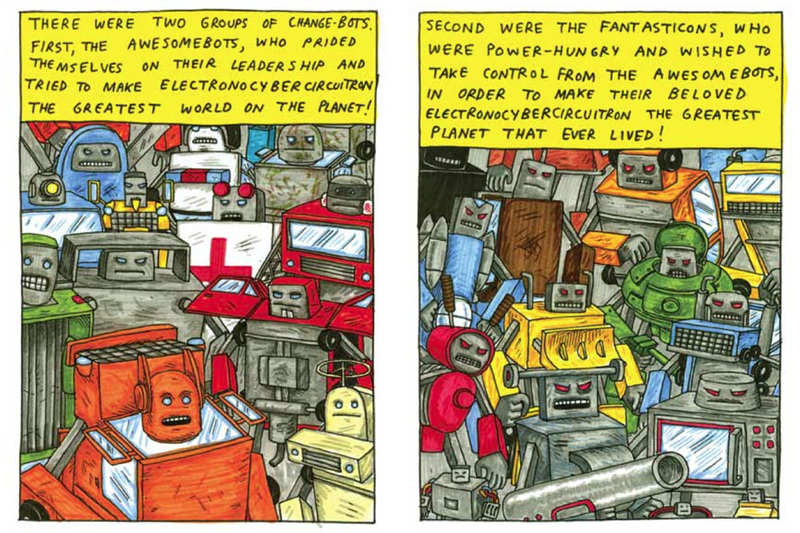 Jeffrey Brown, a cartoonist who may be best known for his semi-autobiographical comics like Clumsy and Undeleted Scenes, has taken all of the stuff we loved about old-school Transformers and cleverly satirized them in comic-book form. Incredible Change-Bots 2: The Vengeful Return of the Broken picks up a few years after the first book, but for those (like myself) who missed the first installment, there's a handy synopsis at the start of this book. Basically, the Awesomebots and the Fantasticons fought their big war on Earth, which resulted in the defeat of the Fantasticon leader, Shootertron. They joined forces and took off in search of a new home. Of course, what nobody expected was that Shootertron was still alive, buried deep beneath the ground! Okay, yeah, probably everyone saw that coming, but that's sort of the point. Incredible Change-Bots takes a lot of the tropes of our beloved Saturday morning cartoons and mashes them up into a hilarious take on giant (and not-so-giant) robots battling it out for no really good reason. When Shootertron comes to, he has lost his memory and has no idea who or what he is. He's adopted by a farmer couple, Edna and Stanley, who nurse him back to health and enroll him in high school. Meanwhile, the military has their eye on him, in the hopes that they can control him and turn him into the ultimate weapon. Oh, and did I mention that — due to some slight miscalculations — the rest of the Change-Bots are headed back to Earth? Naturally, that leads to another big confrontation between the Awesomebots and the newly-re-formed Fantasticons. The book is hilarious. Brown's drawings have a charming crudeness to them, and the book gives the impression of a couple of kids playing with their toy robots, making "bew! bew! bew!" noises and spouting absurd dialogue. It's also really clever, though. Incredible Change-Bots is a parody by someone who clearly knows his source material well, and it's a delight to read. If you're a fan of Transformers but were just a bit disappointed in the more recent big-screen versions, pick up a copy of Incredible Change-Bots 2 and get ready for a thrilling (and cheesy) ride! You can buy the book from Top Shelf Comics, Amazon, or check with your local comics shop.